I wanted to share some of my favorite photos of my time in Guinea. Volunteer-led yoga session on the roof of the PC office in Conakry. The PC office in Conakry. View from the top of the PC office in Conakry. Murals inside the PC compound in Conakry. A shot of the PC office in Conakry. Shots of Taouya, Conakry from the roof of the PC office. The ocean, as seen from the PC roof in Conakry. A glimpse of the gorgeous views seen driving through the Fouta Djallon region of Guinea. Fode poses with rice on his head. Mariam and Nene smile for the camera. Mariam with her two children, David Jr. and Papi. A view of a gardening collective. Members of a gardening collective pose in front of their land. Members of a gardening collective work at weeding their plots. A member of a gardening collective poses for the camera as she takes a break from her garden work. My counterpart’s children pose for the camera. The twins are unsure if I’m a devil or not. My 2nd family — my counterpart, Mangue TP, and his wife, Madame Sylla. Bountourabi watches her mom cook. She likes to help and often ‘plays’ cooking and cleaning. The view from the road of my family’s compound. Our road is paved because we live in the former president’s home village — he paid for the road to be paved. A neighbor poses for the camera. My host-mother and her friend on her wedding day. Madame Sylla at the beach in Koba. Mangue and Mdm. Sylla at the beach in Koba. Riz gras, a Senegalese dish — my favorite!!! Anyone who has spent any time immersed in Guinean culture will be able to confirm the ubiquitous nature of the phrase “du courage”. You’re sick? Du courage. You can’t find work? Du courage. You’re having a fight with your wife? Du courage. The phrase roughly translates to stay brave and in area of the world where luck and chance play a large role in daily life, it is excellent advice. 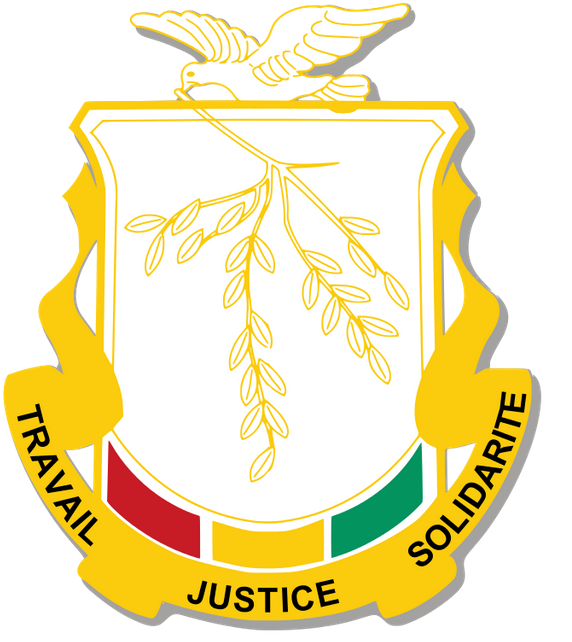 The national motto of Guinea is “Work, Justice, Solidarity.” Here in the United Sates, we are quite familiar with work and justice. In 2010, when unemployment rates soared to 10% we considered it a national crisis – compare that to the latent 60% rate of unemployment faced in Guinea. And the United States is famed for its justice system, which although flawed, unfortunately functions at a rate incomparable to most other countries around the world. But solidarity, the feeling of unity between people who have the same interests and goals, is an area in which we lack. In the Guinean context, solidarity is seen on a daily basis. It can be a young woman preparing meals for the surrounding elderly neighbors and single males because they have no one who will prepare for them. It can be a mother giving her hard-earned money to another mother who needs it more than she does. It is seen when a young man helps out his neighbor in the rice field while knowing he will not be compensated. 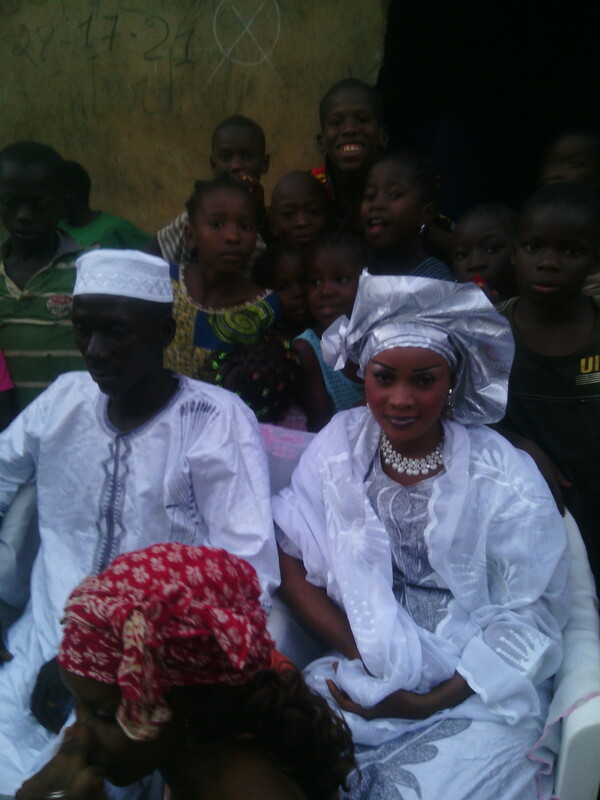 Or perhaps when a community pools funds to help celebrate the marriage ceremony of a young man and woman. A recently married man and woman at their ceremony. 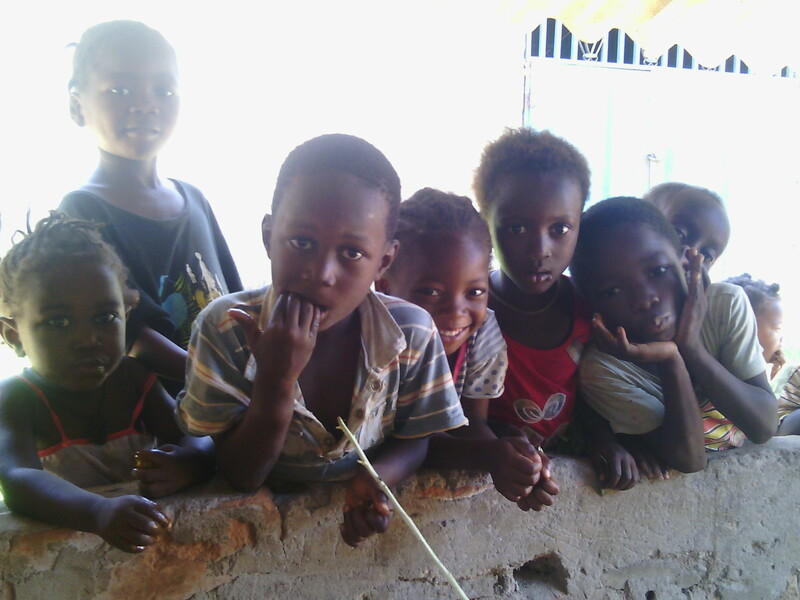 Guineans are united, and in my short time in Guinea I began to feel a part of something. Now, when I call my friends and host-family back in Guinea, we ask about each other’s health, the health of loved ones, how business is going – the typical Guinean salutation is much more in depth than “How are you? Fine”. And when we get through asking about Great Aunt Fatou’s health, the conversation inevitably turns to the current situation – “When are you coming back? I don’t know” and it always ends with “du courage”. When first in Guinea, I thought it was silly for people to advise me to stay brave while I was stooping over the latrine all day. How will bravery help me fight diarrhea? What I need is medicine and rehydration! 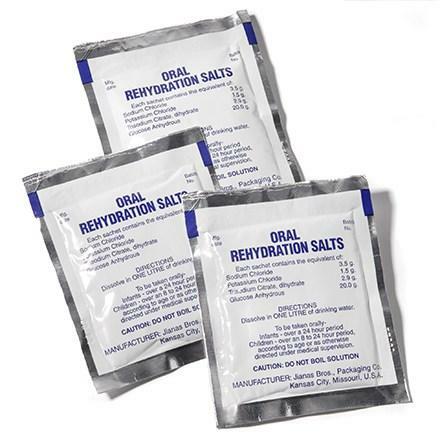 Oral rehydration salts, also known as the best friend of every volunteer who has ever had diarrhea. They are also being used as supportive care for Ebola patients. The under-five mortality rate is 101 per 1000 live births, compared to a global average of 48 per 1000. Life expectancy at birth is 58, compared to a global average of 70. Prevalance of tuberculosis, malaria, and HIV are all significantly higher than the global average. The maternal mortality rate is 3 time shigher than the global average. Only 20% of the population has accessed to improved sanitation conditions. The country has an average of 2.6 physicians per 10,000 citizens. When access to resources is so difficult chutzpah, bravery, and a certain oomph are needed to survive on a daily basis. People fight tooth and nail just to live in Guinea, but they fight together. You are never alone — extended families open their arms and their hearts to feed even the most remote relative. Care is communal. Strength is found in numbers. People stick together. So, to all my friends in Guinea — du courage. To all our neighbors in Liberia and Sierra Leone — du courage. To the doctors working in the field — du courage. To all those involved in combating Ebola — du courage. To all those who have lost a friend or family member due to Ebola — du courage. To all those who have been misplaced from their home due to Ebola — du courage. You are down, but I am here to tell you to be brave and that we are together and we will pass through this hardship together. We will fight this — together. Please consider donating to one of the following organizations who are continuing to work to combat the Ebola outbreak in West Africa. MAP international is providing protective suits for health workers treating Ebola patients. Unicef is providing protective equipment for health workers and supportive medication for patients. Doctors Without Borders, those working on the ground to treat Ebola patients, claim to be fully funded for the outbreak but are always in need of more money and will likely still be working in West Africa once the outbreak passes to deal with the fallout of the healthcare infrastructure. And please read this Time Magazine article written by the President of Doctor’s Without Borders to get an accurate sense of the desperation on the ground. More people are needed. For my U.S. readers, please consider writing a letter to your representative. The universe is mysterious. Life events have seemingly conspired in three ways to bring me to Washington, D.C.
As I’ve previously written, all volunteers in Guinea have been sent home temporarily due to the Ebola outbreak. But the week before we were removed, I had an MRI done that revealed a torn ACL in my left knee. Remember when I wrote about a small injury during a Malaria soccer event? Yeah… that pop was apparently more serious that we thought. I was in the midst of discussing my medical evacuation to Washington, D.C. with the medical office when Peace Corps made the decision to bring all volunteers home. As if those two twists weren’t strong enough to keep me in D.C., I’ve been selected as a winner of the Peace Corps Blog It Home competition and will be participating in a conference mid-September with 8 other current volunteers. Thanks to you all for your votes and support! There’s some type of energy pulling me here. It’s beyond my comprehension but I know enough to recognize the odd coincidence of it all. I’m not sure what will happen, what life will dish out, but I am open and remaining positive. The view from my suite. Georgetown is gorgeous — full of tiny shops and restaurants for moseying around and spending money I don’t have — and we’re only a mile from the Peace Corps HQ downtown! I’m now in Georgetown with other medically evacuated Peace Corps volunteers. We’re in a lovely suite-style hotel and I’ve met several volunteers in my day and a half here – Malawi, Indonesia, Philippines. Tomorrow I have surgery at the George Washington University Hospital to repair my ACL and possibly also my MCL. For all you medical nerds, I’ll be receiving a cadaver graft. Recovery to walking is 6-8 weeks with full range of motion recovery in 4-6 months. I anticipate being back to Guinea within 8 weeks, inch’Allah. It doesn’t hurt as bad as it looks, I promise. I don’t really know what to expect and I’d be lying if I said I wasn’t a little scared, but the injury has already happened so there’s nowhere to go but forward. Nothing to do but heal. It’s a common injury and the surgeon is confident I will recover and be able to return to Guinea. I may have issues with arthritis later in life, but I will be better off with the surgery than I would be living on a torn ACL. Many people have been surprised at the seriousness of my injury — myself included. I’ve been walking and biking several miles a day for months with limited pain. I always thought an ACL tear was a debilitating injury. Doesn’t it sound scary? But, I’m here to report to you all that it’s actually not that bad until you make a sharp pivot or unexpected shift in weight. That’s when you feel your entire knee buckle under excruciating pain. Surgery is definitely needed. So, updates to come. I don’t know much and I’m going with the flow. In my healing downtime, I’ll write more about Guinean culture and be sure to keep you apprised of my new life in the states. If you’re in the D.C. metro area and want to buy a cripple a drink, you know how to contact me. This time last week I was in a plane flying from Boston, MA to Baltimore, MD. Two kind strangers lightened my five hour layover by listening to my slack-jawed stories in the airport bar and laughing with me at the surrounding absurdities. They bought me Yuengling, a cheeseburger and a reassured comfort in the kindness of America. Now I write from between the sheets of my queen-sized bed in suburbia. My post on Ebola went viral, picked up by both WordPress Freshly Pressed and the Today Show. I’m grateful to play a hand in the dissemination of information and have been touched by the outpouring of kindness and support from fellow PCVs and RPCVs. Welcome to all new followers — I hope you enjoy your stay. It’s very easy to paint this whole situation in a negative light. I don’t want to be back – not to a home that no longer feels like home. It’s scary and overwhelming and my heart aches to be in Guinea. I’m surrounded by those who love me but who do not understand my discomfort. Fantasies of air-conditioning and pad Thai had during a 5 hour bush-taxi ride are now replaced by deep desires for peanut sauce and rice shared with family. If I let my brain roam free, a panic begins to rise. I’m working to reign it back in and focus on the positive, search for the silver-linings, and make the best damn lemonade I can with all these red, white, and blue lemons. 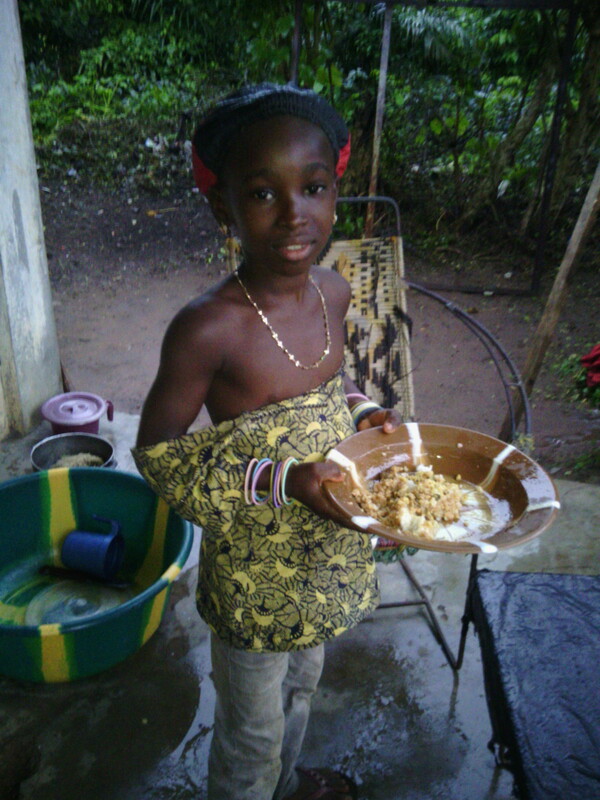 My counterpart’s daughter, Oumou, with some rice and sauce for me. In the days preceding our removal from Guinea, a fellow volunteer shared with me a short story he once was told about the changing and evolving nature of self during the Peace Corps. You leave America as an “A” and you are slowly changed into a “B” by living in your host-country. When you return back home after service, you find yourself a new complex mixture of the “A” and “B” you once were — a “C”. And, if you return back to your host-country, you find yourself not quite completely the “B” you once were, but changed again into a “D”. So I’m a “C” and navigating through old waters is proving tougher than imagined. Yesterday I had a grilled cheese sandwich from a local restaurant and cried at how good it tasted. Today I drove past my old high school and cried at how incomparable it is with the local high school in Koba. The August heat of the mid-Atlantic reminds me of Guinea. It poured the entire ride as my mom drove me home from the airport – it felt like Guinea was with me, reminding me that it would be okay as my mind churned and tried to process the clean, paved roads of I-95. America has so little trash littering the streets, yet we produce far more trash than Guinea ever could. Where does it all go? The process of waste disposal in this country seems more magical to me than ever before. I spoke to an airport worker in France in Susu. He was from Cote d’Ivoire but we both knew enough Susu to have a conversation about the day, the travels, work, and our families. He was a much-needed pick-me-up; a reminder that these two worlds don’t have to be separate and one flight home isn’t the end of an 8 month journey through culture, language, and life. It’s only been one week and there are many more to come. This is a layover – only we’re not sure just how delayed the flight will be and, fortunately, we can leave the airport. Like all layovers, how the time passes is up to us. We can plug in our earphones and tune out the world, recede into bedrooms and pass the day with Netflix. Or we can take a deep breath and strike up a conversation with the strangers to our right and left and share our stories. There are so many interesting people to meet and interesting things to do. I can’t shut them out just because I’m sad and overwhelmed. Now, more than ever, I must remember positivity and to stay grounded. 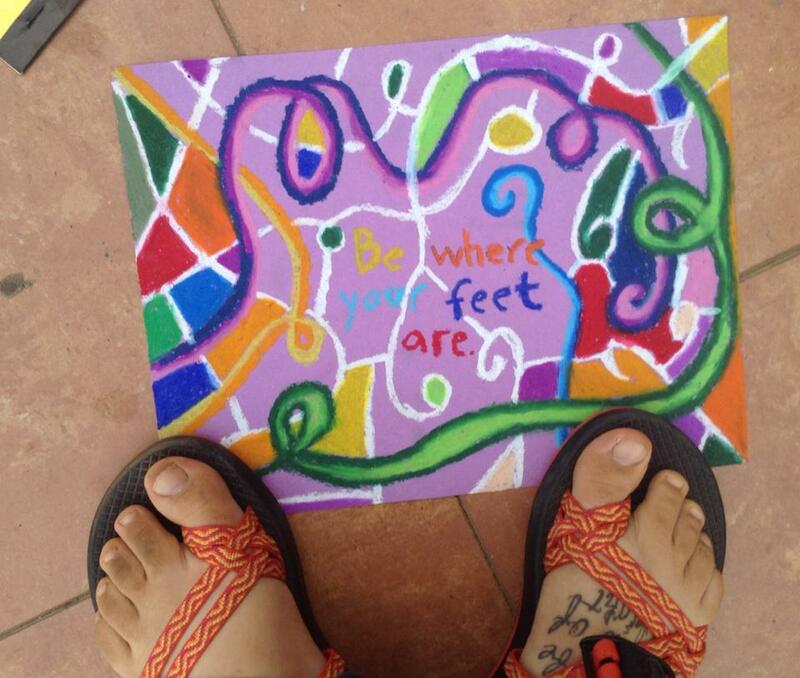 The toes and artwork of one of my inspiring friends and fellow PCV, Amanda. In the weeks to come, expect to see posts detailing life on Guinea as well as readjustment back to the United States. Thank you for your time and support.